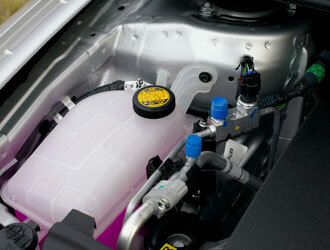 The cooling system in your vehicle is very important. It keeps you cool and your car from overheating. It’s important to have maintenance performed on your cooling system to keep it in good working order. The mechanics at Ron’s Auto and RV are experts when it comes to keeping your car cool. By having your cooling system flushed you can ensure it’s running at maximum efficiency. Take a look in your owner’s manual to see the suggested interval for having your cooling system flushed. An average recommendation for most vehicles is around 40,000 miles. The expert technicians at Ron’s Auto and RV will drain all the coolant from your cooling system, flush the lines and then refill with clean, fresh coolant. How will I know I need a new thermostat? If you keep your cooling system maintained with regular flushes and coolant changes, it can greatly extend the life of your thermostat. If your car’s temperature gauge is going and staying high, your heater isn’t working properly, or you have a warning light on your vehicle’s dash. These are all signs you might need a new thermostat. If you’re experiencing these issues but are unsure as to whether or not they’re related to your cooling system, please give Ron’s Auto and RV a call to speak to an expert mechanic today.